I had to fly to White Plains, NY, for work last week. And had a full day to travel, so I picked the most interesting flight I could find. 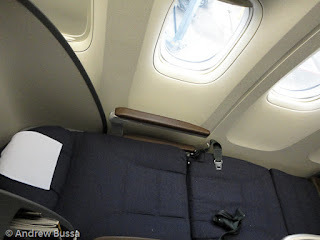 I was able to book an international configuration 777 with the new lie flat beds in business. My upgrade cleared (I wish I could book business directly) and I was flying 6A to Chicago. 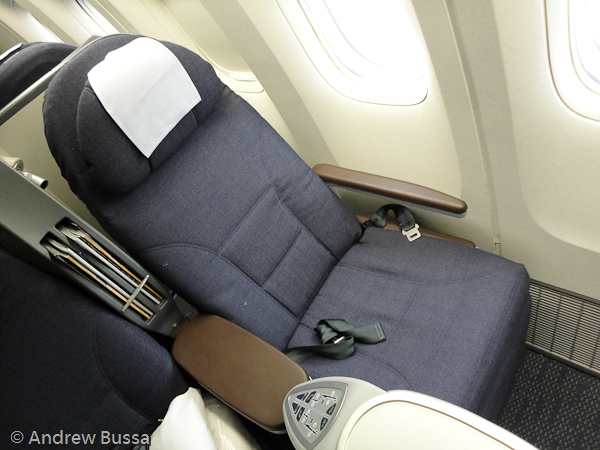 The United 777 business class seats are set up with five rows of 2x4x2 seating. 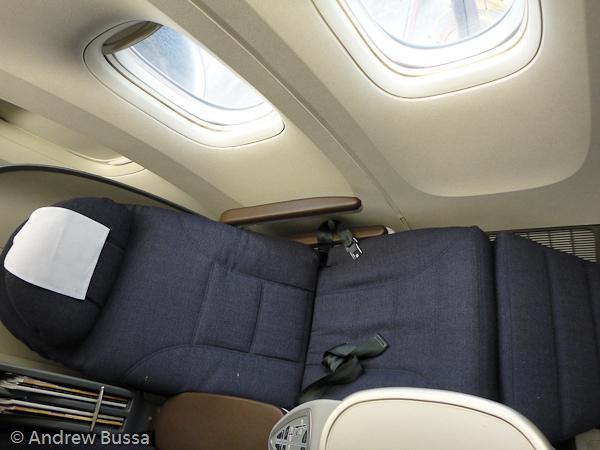 The middle seats don’t have a lot of privacy and the cabin felt a little crowded. United Airlines’ business class seat is one of the best in the air. It is about six feet long is truly flat (parallel to the floor). There is a good AVOD system with a great selection of movies, new and old. I watched Wall-E on my trip and a bit of Toy Story 3. There is no under seat storage with these seats, so I grabbed my Bose headphones and Economist and tossed my bag in the overhead bin. The seat controls are easy to understand and there is a myriad of comfortable positions for the seat. The window seat has a good feeling of privacy, but it is not impossible to have a conversation with your seatmate either. 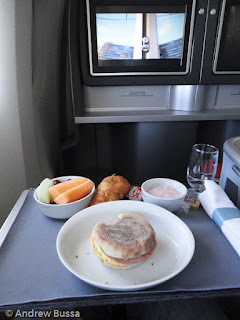 United does not have the best food in the air, usually their good meals can be described as edible. Breakfast was an egg McMuffin and yogurt. Not bad, but not filling or exciting either. Continental has a much better breakfast spread and I hope the new United keeps what Continental serves. The Bailey’s and coffee was ok, United switched coffees and I am not a fan of the new blend (United Club coffee is unpalatable). Increasing the ratio of Bailey’s to coffee fixed the taste problem. The flight went quickly and the service ended early due to turbulence over Illinois and Wisconsin. It was a pleasant flight staffed with a senior crew that was very professional and enhanced the experience. 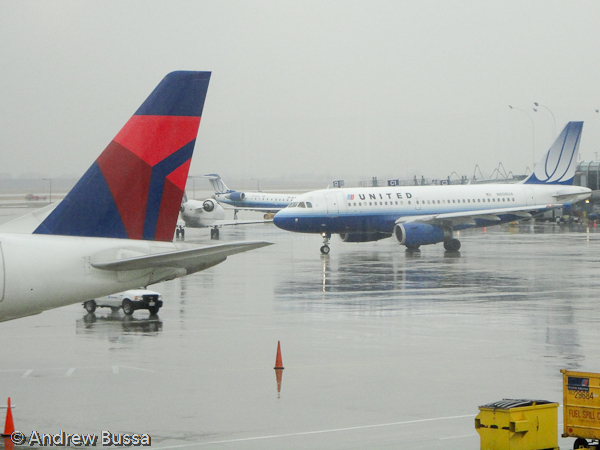 It was raining in Chicago and my E170 flight to HPN was canceled. I lost my first class seat, had an extra three hours at ORD (I wasn’t the only one with an extended stay, there was not a single open seat in the F gates United Club), and was stuck on a CRJ. Still, could be worse, I could have been in the office.